After months of tying up loose ends, we are now in a position to announce the final donation to The Children’s Trust from the 2018 Banstead Village May Fayre. The 2018 Fayre was a fantastic event and a wholly combined effort from the committee, sponsors, volunteers, participating groups, the people of Banstead and of course the sun which made it the most successful May Fayre to date. 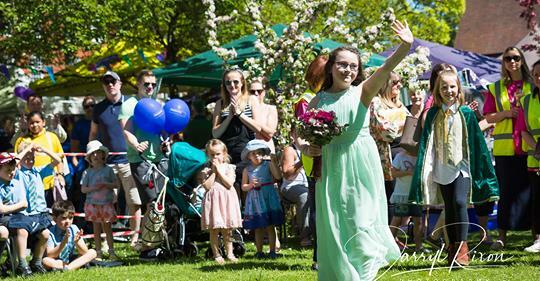 It is with great pleasure that Ruby and The Banstead May Fayre Committee confirm the total amount being donated to The Children’s Trust for the 2018 Banstead May Fayre is £13,000.00! The final cheque will be handed over on Thursday to Karen Philipps, Community Fundraising Manager (South East) at The Children’s Trust in Tadworth this morning. Joining us in celebrating this achievement were many of the sponsors of the event along with Councillor Dorothy Ross-Tomlin, Mayor of Reigate and Banstead. If you would like to take a look at the photographs taken by our official 2018 photographer Darryl Rixon Photography http://www.darrylrixonphotography.co.uk/, please following the link, https://darrylrixonphotography.pixieset.com/bansteadmayqueen-After months of tying up loose ends, we are now in a position to announce the final donation to The Children’s Trust from the 2018 Banstead Village May Fayre. The final cheque was handed to Karen Philipps, Community Fundraising Manager (South East) at The Children’s Trust in Tadworth on the 25th October 2018. Joining us in celebrating this achievement were many of the sponsors of the event along with Councillor Dorothy Ross-Tomlin, Mayor of Reigate and Banstead. May we take this final opportunity to thank each and every person responsible for making the day a success and look forward to seeing you again on Saturday 4th May 2019 at next year’s fayre where we will be raising money for The Breck Foundation The Breck Foundation Website. For further information, please visit our website or contact us via Facebook.